GUELPH, ON, Aug. 30, 2016 /CNW/ - Today, The Co-operators Board of Directors announced the appointment of Rob Wesseling as President and Chief Executive Officer (CEO), The Co-operators Group Limited, effective December 1, 2016. 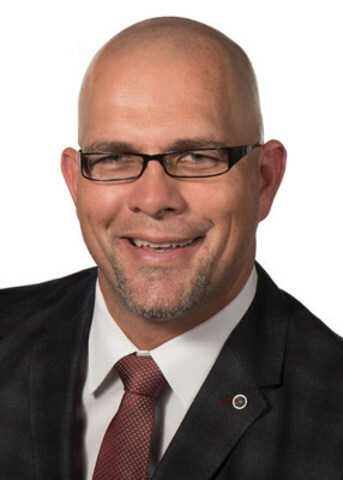 Currently The Co-operators Executive Vice-President (EVP), Property and Casualty (P&C) Operations, Co-operators General Insurance Company, and Chief Operating Officer (COO), The Sovereign General Insurance Company, Wesseling spent the last 19 years with The Co-operators in increasingly senior leadership positions. He was appointed COO of The Sovereign General in May 2007 and, in November 2011, he assumed the additional role of EVP, National P&C for all P&C operations across the group of companies. "Rob has the ability and desire to lead our organization while positively impacting the co-operative movement. He's an inspirational and innovative leader who will ensure The Co-operators relevance, strength and sustainability long term," said John Harvie, Chairperson of the Board of Directors. "In addition to Rob, the number and quality of internal and external candidates who came forward to fill this leadership position speaks to the reputation of our organization, and I'd like to thank each of them for their commitment to this process. My gratitude also goes to the CEO search committee who dedicated their time to carefully interview and recommend the best candidate for the job." Wesseling's current involvements include his leadership in flood resiliency in Canada. He has been instrumental in engaging all levels of government, the academic community, and various industries, to develop a complete solution for Canadians. He is an acting member of the International Co-operative and Mutual Insurance Federation (ICMIF) Board of Directors and Executive Committee; member of the ICMIF's Development Committee; and, founding director and member of Partners for Action Advisory Board. He holds a B.A. with distinction in Theoretical Mathematics and MSc. of Applied Statistics from the University of Guelph where he graduated in 1996. He obtained a Chartered Insurance Professional designation in 1999. "The Co-operators is more than just a financial services company," said Wesseling. "Our co-operative nature guides our bone-deep commitment to our members and to the clients and communities we serve. We look to the future from a position of strength, recognizing that our relevance is dependent on our ability to anticipate and respond to their changing needs and preferences. I am eager to engage with the entire Co-operators team as we write the next chapters of the story." Wesseling replaces Kathy Bardswick, current President and CEO, The Co-operators Group Ltd., who announced her retirement in February 2016. Bardswick will be retiring December 1, 2016 when Wesseling assumes the role. The Co-operators is a leading Canadian co-operative insurer committed to furthering its bilingual workforce and Wesseling is dedicated to enhancing his French language abilities. Prior to his post, Wesseling will re-locate to Quebec where he will be fully immersed in a French language program for approximately eight weeks. The leadership team will be developing a more detailed transition plan in the coming weeks.